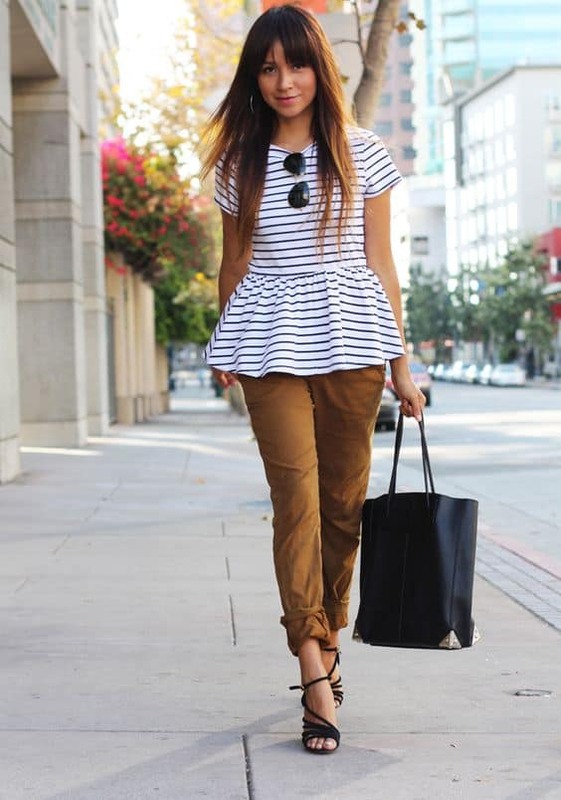 How to Wear a Peplum Top? 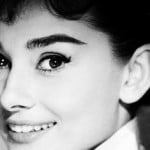 Along with the trend of the 50s , is back in vogue a peplum top or a peplum blouse. This item is in a traditional costume looks like a strip of fabric sewn to the waist. The collections of the season designers have proposed a variety of options for the form, length and material bass voice. Peplum appeared in Europe as a consequence of borrowing suit Frenchmen this element of traditional costume Basque. At the bustle it was designed to enhance the contrast and to emphasize the silhouette slim waist, which was corseted. The revival of the peplum had on the 50s, when, after years of heavy military style is back femininity. Peplum fashion designer presented a new life was Cristobal Balenciaga. Soon after Christian Dior made ​​the peplum part of the famous silhouette of New Look. What to Wear with a Peplum Top? This season, the peplum top was added to collections, which are very different in style brands. Designers have used unusual materials for this part – from lace to leather. Constructions of peplum have the different lengths and shapes. Somewhere it departs only slightly from the hips, somewhere almost perpendicular to them. 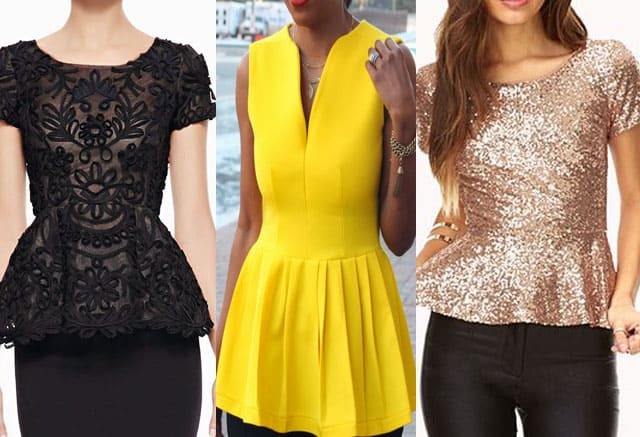 There are many options, how to wear a peplum top in various styles of women’s clothing, we explain the most worthy of them. The basic rule of etiquette – to choose the right pair of decent and not burden the image of bulky accessories. The classic combination – a peplum top and pencil skirt. The color can be both identical and contrast. White peplum top looks great with a black skirt and a red, blue or brown. Fabric with print is rarely used when sewing the peplum top, because folds distort any image. The exception is outright abstraction and small peas. Pencil skirt with bright floral ornaments or vertical stripes with solid color peplum top will look incredibly impressive. Ways to wear a peplum top with accessories: them and footwear should be selected to match any top or in one of the colors present on the skirt. Trousers for a peplum top have to choose narrow. 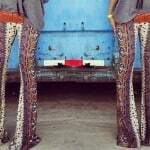 It can be pants-pipes, straight trousers with arrows, skinny jeans or leggings. Pants with arrows is an excellent choice for business style outfit, pick him a bright top with not very wide a peplum top. Perfect way for peplum — black skinny jeans outfit. Outfit with jeans is one of the best ways to wear tops from simple fabrics – cotton or fine knitwear. For the trip to the café or to a party, choose tops with lace a peplum, as well as clothes made ​​of satin and velvet, combining them with trousers of expensive smooth materials – satin, silk, leather. Young fashionistas can safely wear bright leggings and equally cheerful top with peplum top. We recommend to pay attention to the broad peplum, which is behind a little longer than the front – this tank is partially or completely covers the buttocks and hiding the tummy, so leggings can afford a girl with a not quite perfect figure. Note that a peplum top visually reduces growth. If you — pretty low, be sure to add an image heels. A long-legged girls may be advisable to a peplum top leggings 7/8 length – elegant and simple combination of both. Black peplum top with a black pencil skirt – complete no less spectacular. It is necessary to supplement it with gold accessories, and you can go to the theater, and in combination with beige shoes and restrained ornamentation this outfit perfect for office work and business negotiations. 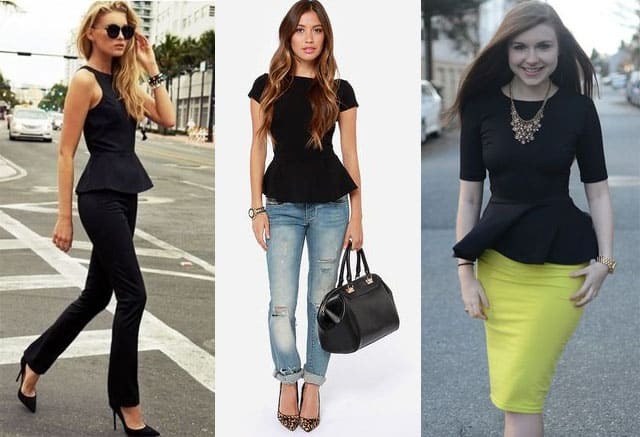 There is nothing easier than to create a feminine image with stamp black peplum top. Suffice it to wear trousers in the same color, but to the overall impression has not turned out too dull, choose a bright pink shoes with prints and a jacket. A peplum top is bright accessory, so do not overload the image details. The most common option to combine with the dress is a jacket, the main condition for its selection is a prerequisite, it is necessary that he covered the peplum completely! Over a peplum top you can put on a short jacket, with the peplum left in plain sight. As color outerwear selected k the contrasting with a peplum top. Light salmon peplum top and white skinny pants is a harmonious blend of elegance and courage, charm and audacity. Eggplant peplum top with yellow blazer and black skinnies. Romantic and cute image.